Congratulations on getting your new foreign teaching assignment! After over 20 years of assisting educators for countries such as the UAE, Qatar or with TESOL Certificates for China, we understand that moving to a new country and starting a new job comes with its challenges. That’s why our experienced team is here to ensure that your documents qualify with your new employer. When accepting your new position either your recruiting agency or new employer may have asked you to provide your Diploma, Degree, Transcripts and/or Marriage Certificate if your spouse is joining you. In addition, to ensure the documents are valid for acceptance, they will have asked that you have each document authenticated and legalized or apostilled / attested. What does that mean for you? Let’s start with the first step of authentication that takes place at Global Affairs Canada located here in Ottawa. As we have seen after over 20 years of providing service to Teachers, certificates can come in all shapes and sizes. This can make it difficult for us to determine if you have the correct one without first seeing it. To help with this please feel free to use our quote request as it will allow you to upload the certificate for one of our experts to review. If you are not sure whether your education document meets the requirements for authentication, not to worry, our consultation will make sure that it does. The majority of education documents such as a provincially issued Teaching Certificate, Teaching English as a Second Language (TESOL) Certificate or Professional Designation Certificates, to name the most common, must be notarized or made into notarized copies in order for them to be authenticated by Global Affairs Canada Authentication Services Section. However, there are many TEFL and TESOL certificates that Global Affairs Canada cannot authenticate even if they have been notarized. This is because not all institutions which issue these certificates are recognized by the Canadian government. Click here to see which TEFL and TESOL certificates are valid for authentication at Global Affairs Canada after they have been notarized. Global Affairs Canada can authenticate a Canadian University Degree and Transcripts from an institution recognized by the provincial Ministry of Education. All must be signed and have an embossed seal by the university or college. The original can be authenticated or a notarized copy made by a Canadian Notary Public. If you need assistance with this ask us about our Notary Services. We can make a certified copy for degree authentication to save stamps and signatures on your original degree. 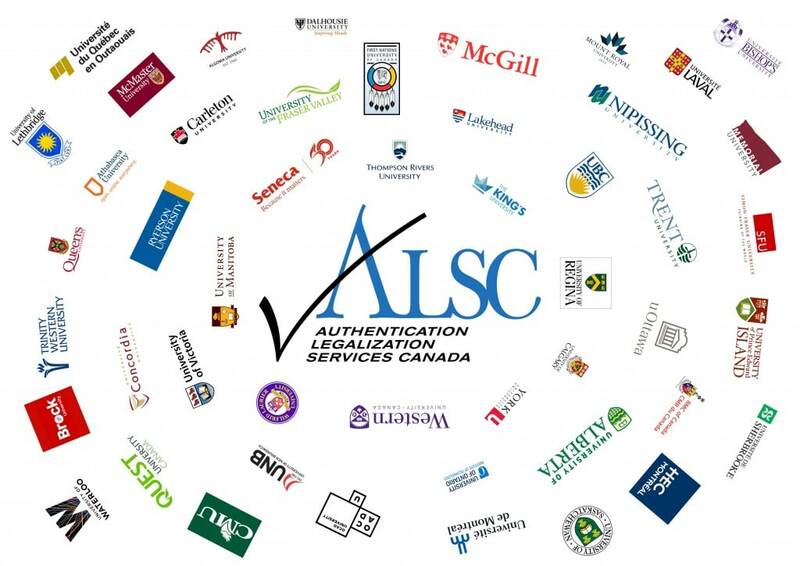 To save valuable time from the Global Affairs Canada current processing time of 20 business days, see more about our teacher certificate or degree authentication service options to speed up the process to as quick as 1 business day. The second step of Attestation / Legalization takes place at the embassy consulate of the country where you are going to be teaching. Most embassy consulates are located here in Ottawa and charge a fee to provide document legalization services. In addition, some have other requirements and processing times that change often. For some countries official transcripts may also be required. These must be signed by the University Registrar’s office and sent directly to the consulate in order for them to legalize your degree. When you use our legalization services we take care of all of that making sure it gets done correctly and meets your timeline. 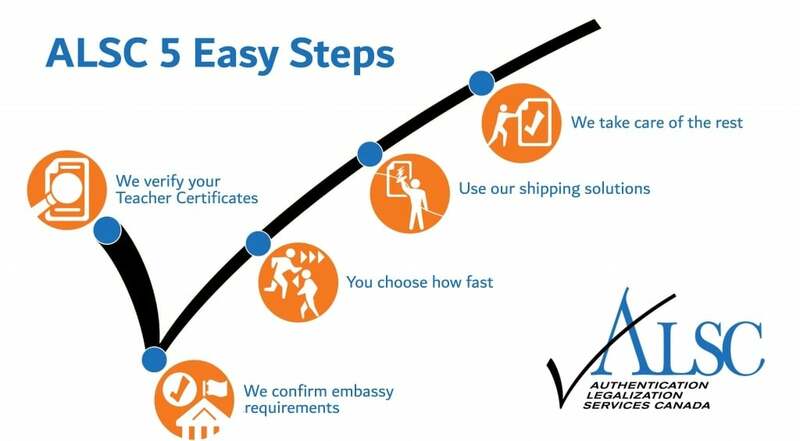 After your documents have been authenticated and legalized we can return them back to you or forward them on to your new employer using one of our document shipping made easy solutions or using your preferred delivery method. As Canada’s first provider of authentication and legalization services we look forward to assisting you and giving you peace of mind to concentrate on the next steps in your big move. When you use our service you can know that all is being done correctly and on time to secure your teaching assignment abroad.